Bridal Salons, Bridal Boutiques, bridal gowns, Bridal Stores, Bridal jewelry, bridal veils, wedding jewelry, wedding veils, bridesmaids jewelry, bridesmaids accessories, bridal accessories, wedding accessories, wedding fashion, bridal gowns, bridal accessories, bridal necklaces, bridal earrings, bridal bracelets, bridal crowns, bridal tiaras, bridal fascinators, bridal headpieces, bridal sashes, bridal belts, wedding gowns, wedding necklaces, wedding fashion, bridal fashion, wedding jewelry, accessories, jewelry, bridal circlets, bridal diadems, bride’s fashion, bride’s accessories, bride’s jewelry, bride’s necklaces, bridal hair ornaments, wedding hair ornaments, blusher veils, cathedral veils, embellished veils, rhinestone veils, veiling, bridal veiling, wedding veiling, tulle, lace veils, vintage veils, vintage jewelry, antique bridal jewelry, rhinestone bridal jewelry, cage veils, circular veils, double layer veils, trimmed veils, cascade veils, simple raw cut veil, pencil edged veils, silk satin edged veils, silk corded veils, metallic ribbon veils, organza ribbon, Swarovski beading, New York Market, New York Bridal Market, Bridal Accessory designer, embroidered veils, lace mantilla veils, mantilla, lace mantillas, Swarovski rhinestones, Swarovski rhinestone veils, French net veils, ivory veils, white veils, diamond white veils, champagne veils, cream veils, silk white veils, tulle veils, Juliet veils, Juliet style veils, waterfall veils, wide cut veil, gathered veils, Justine M Couture. Our designs are crafted from the finest elements available in the world: luxurious fabrics, English illusion tulle, raw silks and organza, authentic Swarovski crystallized elements and unique vintage stones sought from many shores. 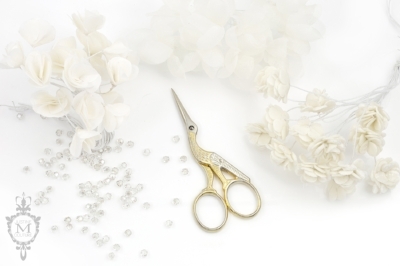 Bringing these elements together to create precious and timeless veils and accessories is our passion, and everything we craft is designed here in the USA. Only the finest Illusion tulle, satin and ribbons, quality metal combs, authentic hand loomed lace imported from France and Japan and genuine Swarovski beads are engaged for our heirloom veils. Embroidery is meticulously hand sewn by our seamstress artisans and hand finished at our studio in San Diego. Justine is applying Swarovski rhinestones onto a prototype embroidered veil (bottom right image). All of our designs are meticulously designed at our Solana Beach, SoCal studio by our team of local artisans and made from scratch. Enamel flowers are hand painted and hand pressed, Swarovski stones are applied one by one, pearls are wire-wrapped and French woven using traditional techniques. Our designs are built to last and are a true labor of love to be cherished and passed down as heirloom treasures for generations to come. Doing what you like is freedom. Liking what you do is happiness ..... Frank Tyger.